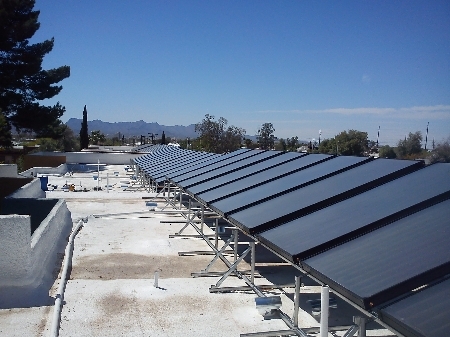 Tuscon, AZ and San Jose, CA May 15, 2012 — Apartment building owners with central water heating systems are realizing the value of installing solar hot water. The latest example is from Zone Verde Apartments in Tucson, AZ, where SunRenu Solar installed Free Hot Water’s made-in-USA solar thermal system, which is estimated to save building owners 67% of their annual water heating costs. When Zone Verde initially considered solar, their initial thought was to utilize solar photo voltaic (PV) panels for offsetting the apartment complex’s electricity costs. But when building managers heard about SunRenu’s option for solar hot water, they changed their solar plans to solar thermal. While having hot water included in a leasing agreement is an added value for renters, carrying the water-heating costs for a 138-unit apartment complex can be substantial. In the case of Zone Verde Apartments, an average of $1,800 per month, or over $21,000 annually went to towards water heating, reducing overall profitability. Through the installation of 48 solar collectors and 3,500-gallon solar thermal storage tank, Zone Verde is expected to save 67% on its annual water heating costs, or an average of $1,200 per month or more. The technology behind the savings is Free Hot Water’s made-in-USA SRCC-rated 8000 series solar collectors, which will produce over 683,000,000 British Thermal Units (BTUs) per year for Zone Verde. Typically, the upfront costs of commercial solar thermal projects are reduced through a solar lease or solar power purchase agreement (PPA). However, in the case of Zone Verde, the management self-financed. Modified Accelerated Cost Recovery System (MACRS), a tax incentive that will also reduce tax-deductible expense of the solar system. In addition to the reduced operating expenses, Zone Verde asset managers say they are attracting and retaining more renters through installing the system. John McDonnell, President of SunRenu, added that the company selected Free Hot Water solar collectors and other equipment because of Free Hot Water’s knowledge base of thermal systems, service, support, and value of their products. “Dealing with experienced individuals regarding solar thermal is hard to come by these days,” said McDonnell. “Some plumbing distributors don’t have the experience with solar thermal, so we know we can count on Free Hot Water for their support, as well as the quality of their products. SunRenu Solar, LLC (“SRS”) is a full service design and installation company based in Scottsdale, AZ. that brings over 30 years of experience in alternative energy products. We have always exceeded the expectations of our clients. SRS was formed in 2008 to meet the demands of the evolving “Green Energy” market. We offer overwhelming customer support and the most extensive warranties in the industry. SRS has established strong business relationships with solar industry leaders and delivered value to a full portfolio of projects including solar carports, solar awnings and canopies, roof and ground mounted PV, solar hot water, BIPV, and many more. We have assembled a team with the experience and expertise that includes some of the longest tenured individuals in the solar industry. We are committed to quality workmanship and over whelming customer care which are without rival in the solar industry. SRS has executed solar design and implementation of PV and thermal systems on apartment, office, and industrial properties. This is the result of “hands on” site analysis with appropriate engineers, energy analysis, preliminary design layout, system sizing, project bidding, rebate application consultation and submission with a relentless pursuit of client satisfaction.